There’s one level of clean that’s good enough for your family. But, with guests coming, you need to go deeper than usual: attacking soap-scum buildup, neglected toilet tanks, partially clogged drains, and any signs of mold or mildew growth—all of which contribute to odors your guests are much more likely to notice than you are. Deep clean, defrost, and organize your fridge, making extra space for all the leftovers your entertaining will yield. Assuming at least one or two guests will offer to help with the washing up after meals, make sure your dishwasher is sparkling and that the insides of drawers and cupboards are spacious, well organized, and free of crumbs and other debris. Inspect ovens for burnt-on bits that could set off your smoke alarm at the worst possible times. And wow your overnight guests with great morning brews by deep cleaning and decalcifying your coffee maker. Offering clean sheets to houseguests is a no-brainer, but, consider also cleaning heavy linens and even rugs, which may be harboring odors you don’t notice simply because you’re so used to them. Another nice touch is to declutter and clear closet and drawer space for guests to stow their possessions, thereby avoiding that unanticipated yard-sale effect that can wreck your perfect holiday décor. If you’ve got guests staying for more than a day or two, you’ll want to offer access to your laundry facilities. Sanitize your washer—newer machines have built-in cycles for this or just run an empty load with bleach followed by another water-only load to rinse thoroughly—and clean lint vents to ensure your dryer operates at max efficiency. Inviting people into your home creates many opportunities for germ transfer. Before and after entertaining guests, do everyone a favor and sanitize or disinfect all the things people touch frequently, including doorknobs, appliance handles, drawer and cabinet hardware, light switches and plates, TV clickers, and all kitchen and bathroom fixtures. 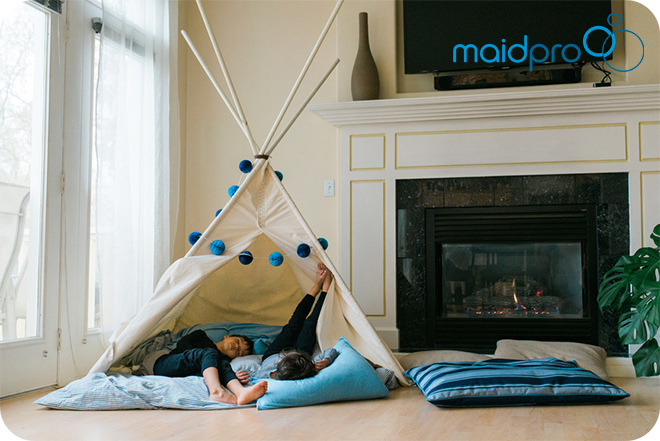 If you don’t think you’ll have time for all that cleaning, MaidPro’s got you covered! Our standard 49-Point Checklist tackles nearly everything above except for the decluttering, drain- and appliance deep-cleaning. Get into the nooks and crannies. Bathrooms have plenty of tiny, inconvenient-to-clean spaces that you might pass over on regular daily or weekly cleanings. For example, when is the last time you dusted out the narrow space between your toilet tank and the wall? Or, the last time you cleaned just under and around the lid of the tank? Both are great spaces for mildew and other germs to hang out and multiply. Other oft neglected spots include around the bases of faucets and fixtures where soap scum and grit builds up and hardens, often requiring scraping for a true clean. While you’re at it, take a good look at your grout, which can usually be brightened up with the right cleaner, a small sturdy brush, and a bit of elbow grease. Inspect and discard all expired stuff. If you have unused prescription meds, bring them to your pharmacy for proper disposal or find out if your city or town offers a drug take-back program. Expired OTC meds can go right into the trash. Be sure to inspect all lotions, creams, and makeup items too, as many have surprisingly short shelf lives. Toothbrushes should be replaced about once every three months and be sure to store new ones in an upright position to enable complete air drying between uses, experts say. Purge the excess. 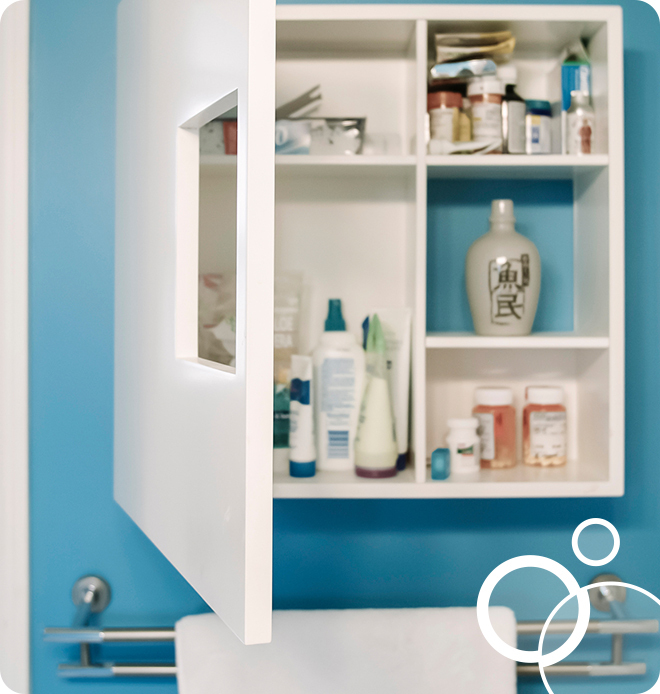 As bathrooms tend to have limited space, give careful consideration to everything you store there. Is there a curling wand that gets used only 2-3 times a year taking up precious real estate? Are there five hair brushes, where one might do? Are you storing large refill containers of shampoos and conditioners bought at wholesale clubs? Remove rarely-used items to a different location, such as a linen closet. The less you keep in your bathroom, the more functional it becomes and the easier it will be to keep clean and tidy all week long. Do make room for critical supplies. No one wants to be the person using a bathroom when it runs out of toilet paper, hand soap, or towels. Nice baskets filled with unwrapped toilet paper rolls and a soap display add decorative elements to your bathroom, while also making family members and guests feel most comfortable. Pre-moistened wipes or a spray bottle and clean rag near to hand make it easy for you and family members to wipe up toothpaste gobs, stray hairs, and other small daily messes. If you ever entertain overnight guests, extra new toothbrushes are great extra items to keep on hand as well. Get organized. If your bathroom often resembles a jumble sale, it might be worth investing in a few elegant, yet simple and inexpensive organizing solutions. Think wooden drawer organizers, canvas totes, shower caddies,and the like. Refresh your look. Your bathroom is one of the easiest and least expensive rooms to completely re-style with a new look or color scheme, especially if floors, counters, and tile are white or neutral in tone. Consider changing up your shower curtain, bath mat, or towels and ‘shopping at home’ for things you might repurpose to add style and keep your bathroom organized. A china sugar bowl, for example, makes a great decorative container for cotton balls or tooth-floss picks, while a shallow serving tray can be a great way to corral lots of small items you want near to hand such as lotions, creams, and perfume bottles. There are also hundreds of chic, decorative paper designs available at low costs for lining shelves and adding visual pop to the insides of bathroom cabinets and drawers. Myth #1 Cleaning surfaces and avoiding physical contact with sick people prevents illness. Truth Most cold and flu viruses are contracted via the eyes and nose, and new victims typically inhale viruses from coughs, sneezes, or just the exhaled air of infected hosts up to six feet away. An estimated 30% of people infected with flu exhibit no symptoms, making them impossible to avoid. While cleaning surfaces can help, frequent, thorough hand washing and not touching your eyes and face are still some of the best defenses against contracting colds and flu. When water and soap are not available, alcohol-based hand sanitizers are a smart second choice, as they have been proven to kill a wide range of bacteria and viruses when used properly (at least a dime-sized amount of product rubbed in for a full 30 seconds over all surfaces of the hands). Myth #2 Sanitizers and disinfectants kill germs on contact. Truth The solutions all require different lengths of time to kill different types of germs, but almost none work instantly. Most sanitizers and disinfections require 5 to 10 minutes to kill all germs. Those that claim for marketing purposes that they “Kill in 30 Seconds” might kill only one organism that fast, but take 5 to 10 minutes for all the remaining important germs! Spraying and immediately wiping dry with disinfecting or sanitizing cleaners kills no more germs than regular soap. Myth #3 Sanitizing, disinfecting, and antibacterial mean the same thing. Truth Each means extremely different levels of germ kill. Sanitizing kills 99.9% of bacteria only, while disinfectants kill 99.999% of viruses, fungi, and bacteria. It sounds like a small difference, but that 0.099% reduces exposure to germs by 100 fold! Buyer beware: so-called antibacterial soaps are only required to contain antimicrobial agents and don’t actually need to prove they kill more than their non-antibacterial counterparts. Myth #4 Sanitizers and disinfectants kill every type of bacteria and virus. Truth To legally state “kills 99.9% of germs,” sanitizers and disinfectants must only prove they can kill a few specific types of pathogens and may not work on the ones you really care about, such as cold and flu viruses. As a rule, if the package doesn’t list it, the solution doesn’t kill it. To find out which germs your product works on and how long it takes to kill them, you’ll need to read the fine print. Myth #5 Sanitizers and disinfectants kills germs on any dirty surface. Truth Sanitizers and disinfectants only need to prove they work on flat, non-porous, and already clean surfaces! Neither can penetrate dirt or into porous surfaces where germs often hide. To kill ALL germs, you first need to clean and rinse away dirt and loose germs, then apply a disinfectant to kill any germs still clinging to the surface. Sloppy cleaning with disinfecting cleaners not only leaves germs behind, it leaves food for germs to feed on and multiply, and enables them to build resistance, leading to superbugs. Long story short, clean well! New Castle County’s premier home cleaners. 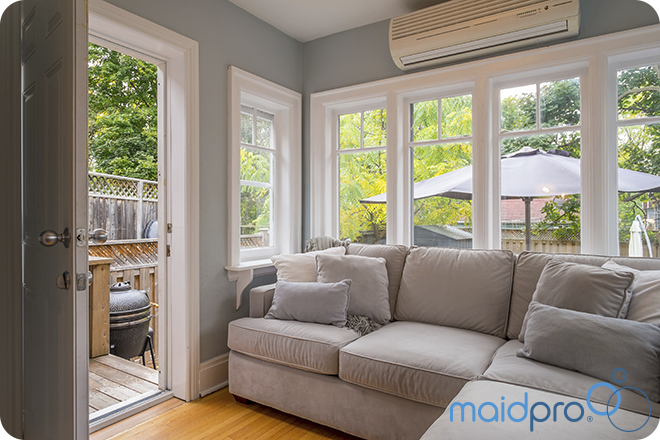 At MaidPro Newark, creating clean houses is our priority. We are located in Newark, and deliver personalized, precise services to Bear, Christiana, Claymont, Edgemoor, Elsmere, Greenville, Hockessin, Manor, Marshallton, New Castle, Newark, Newport, Pike Creek, Port Penn, Stanton, Talleyville, Wilmington and Yorklyn. Whether you want shiny floors in Claymont or sparkling bathrooms in Yorklyn, just call us for all your Wilmington area residential cleaning needs. Professional maid service, with a personal touch. We know and trust our MaidPro employees on a personal and professional level. Our cleaning PROs undergo thorough background checks prior to employment and are bonded and insured. They also receive extensive maid service training to instill the skills needed to clean to the highest standards—yours! And while we strive to help our employees work to their greatest ability, we also make sure to have fun. Because when you love what you do, it shows in your work. Shake Off Those Winter Blahs! If you feel unusually tired, unmotivated to go out and exercise, or find you have developed an affinity for binge-watching TV and comfort foods, you might be suffering from a case of winter blues. Here are seven quick ideas to get you out of winter hibernation mode and ready for spring—which, according to Punxsutawney Phil, is right around the corner! Stop blaming yourself. The shorter days of winter have been altering your circadian rhythms and the complex hormones that regulate sleep, hunger, and feelings of well-being. According to Psych Central, the best way to reset your internal body clock is to allow yourself to wake naturally (versus setting an alarm) at least on weekends and to get at least 20 minutes each day with some skin exposed to direct sunlight. That doesn’t have to be outside. On super cold days, try taking a long drive, sitting near a window, or joining your wise pet for a nap in the sunny spot on the floor. Buddy up! Ask a person whose company you really enjoy to join you for a daily exercise routine. The social aspect will energize you, and on the days you really don’t feel doing it, your buddy can motivate you and vice versa. Check your gear. 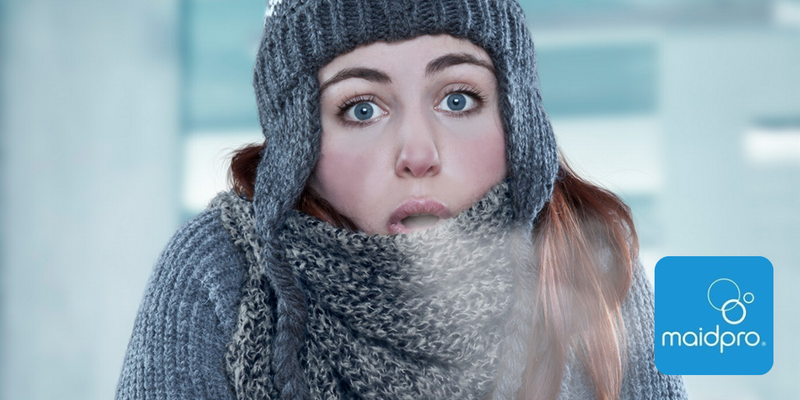 If you shy away from exercising outside in winter, check the quality of your outdoor gear. You’ll be more likely to head outside if you’re confident you’ll be warm and dry the entire time. Is your attire warm enough for all temps? Does it allow for delayering as your body temp rises? Is it designed to wick away perspiration? Does it help you to feel safe from hazards such as snow or ice underfoot and passing vehicles? Having the the gear attire handy for all weathers is a great motivator. Dress upon waking. When you sit around all morning in comfy slippers and jammies drinking coffee or tea, it’s much harder to persuade yourself to get up and go. Dress for exercise as soon as you rise in the morning and you’ll be far more likely to actually walk out the door. Discover new winter activities. Skating, skiing, sledding—all are great fun, but have you ever tried snow shoeing? Ice fishing? Maple sugaring? Curling? Winter bird watching or amateur photography? Building a snowman or starting a snowball fight are other great ways to get your heart pumping while you soak up some sunshine in late winter months. Focus on signs that spring is coming. Maybe it’s a web site that shows day lengths growing by two-and-half minutes each day, browsing seed catalogs for your garden, tuning into the drip, drip of icicles melting, or the gradual return of morning birdsong. Focus on the positive and your mind-body-spirit is bound to follow. Plan a summer vacation. Maybe it’s a week at the beach, a series of fun day trips, or even a productive stay-cation where you take on a strenuous home project you’ve been meaning to get to for a while. The point is to give yourself something to look forward to and/or something to work toward in terms of optimizing your health and physical fitness. Reading three ways. (1) Start a reading challenge where kids earn markers (such as stickers) for each book they finish. Offer non-material rewards for reaching specific goals: for 10 books, a favorite meal for dinner; for 15 books, the privilege of choosing what to watch on family movie night. (2) Select a beloved book somewhat above your kids’ reading levels, get cozy, and read it aloud. (3) Download a free kids classic audiobook and settle back to listen while a professional with lots of great voices makes the story jump right off the pages. Build a fort. Gather a big pile of blankets, comforters, sheets, and pillows. Give kids permission to move furniture to add structure and let them go wild building an intricate blanket fort. They’ll play in it for hours, but be prepared when they want to sleep there too! Cook or bake. Involve kids in cooking and baking projects. Let them do all the measuring and mixing, and demonstrate how to safely use knives, mixers, burners, and ovens. Teach other things, too. For example, what does each ingredient add to a recipe in terms of nutrition, flavor, and function? How is baking a lot like being a chemist? Teach them to clean. Teach kids how to operate real household appliances such as a vacuum cleaner, washer, or clothes dryer. If vacuuming, let them explore what each attachment does and explain what it means to do a thorough job of vacuuming. Show them how to sort, wash, dry, and fold laundry. As an incentive to learn and help, let them keep any loose change they find under cushions or in pockets. If you do this when kids are still relatively young and eager to learn, they’ll have fewer excuses for not helping around the house in their teen years. Introduce ‘old-fashioned’ games. You might not have many board games lying around the house anymore, but there is plenty you can do with a simple deck of cards. Rediscover the joys of playing Go Fish, Crazy Eights, Slapjack, Rummy, Blackjack, Solitaire, Spit, and so many more. You can also encourage kids to research, learn, and practice cool magic card tricks. Online learning. If your kids simply must use their screens, encourage them to spend at least part of the time learning and practicing valuable digital skills such as photo or video editing, making music, animation, orkeyboarding (typing with all ten fingers without looking down). There are literally thousands of great, free tutorials available on YouTube and other sites.